When I was first pitching my ideas around to various sites, I started small. Smaller sites with smaller audiences felt safe. But before long, I decided to take the plunge and start reaching out to larger publications with big audiences. And that decision led me to SheKnows, a media and publishing site with almost 1 million followers on Facebook alone. 948,449 to be exact. That's a pretty massive audience in my humble opinion. Before pitching to SheKnows, I had been published on a few other sites. But I had yet to go viral on my own site with my article about how I wished I could be a better friend. So I wasn't a big name, by any means. Just another faceless voice in a sea of writers looking to be published. And yet... I got noticed. Here's the email I wrote, and I'll tell you why I think it worked below. The rest of the email is cut off, but I continued with the full article written in the body of the email. Here's the nice response I got from the editor. I was rejected, but I'll tell you why I think it's still a win. She passed on my article because I hadn't done my research and didn't realize that they had already covered this topic quite a bit. My bad. BUT she told me she liked my voice and wanted to hear from me again. Just like that, I had the beginning of a relationship with an editor at a huge publication that published in my field of expertise (parenting). Here's what I think worked and what didn't work in the email. I kept the email short and concise. Busy editors need that! I ended up not pursuing writing for SheKnows because shortly after this, the article I published on my own site went big, and I started writing for a few other sites as well. 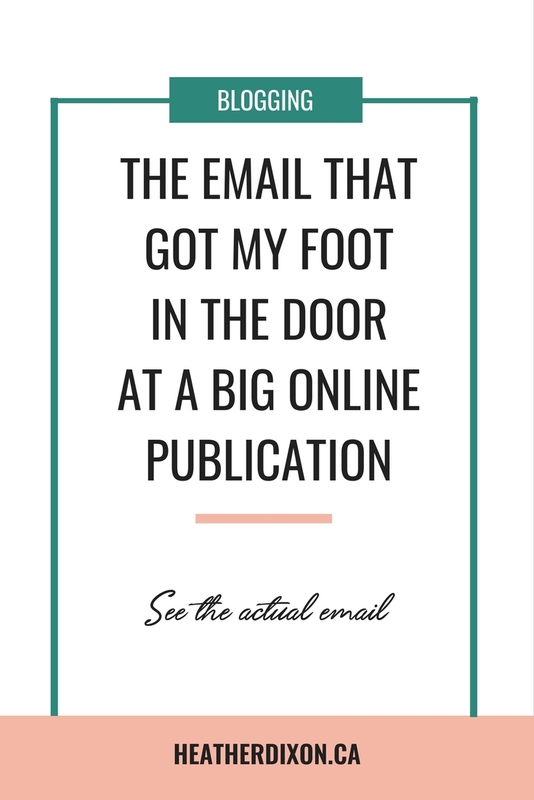 However, I went from being unknown to having a foot in the door, all through email. And I think that's all it really takes sometimes. I hope this helps with your pitching. What other tips do you have for pitching? Would love to hear them! And for more inspiration and encouragement, join tons of other writers just like you in my free Facebook group, Writerly. Join here instantly!